The Club meets regularly on the second Monday of each month at the Bushmead Community Hub, Luton The meetings usually consist of two parts. Firstly reports by the Club Secretary and Club President on the previous months activities and future events and activities, followed by a general discussion. 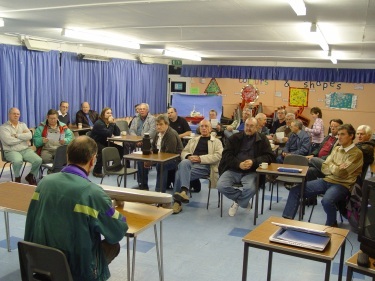 The second part of the meetings vary from month to month and consists of talks by members or invited guests on a variety of subjects of interest to modellers, demonstrations of modelling equipment and techniques, photo sessions of members models, etc. It is also usual for members to bring along to the meetings any models currently being built or recently finished for discussion and advice by other members. The AGM is in September when the Officers of the Club are elected or re-elected as appropriate. We also have a Christmas meeting every year in December for members and guests, when a good time is usually had by all. Dave Hitchcock explains resin coating.